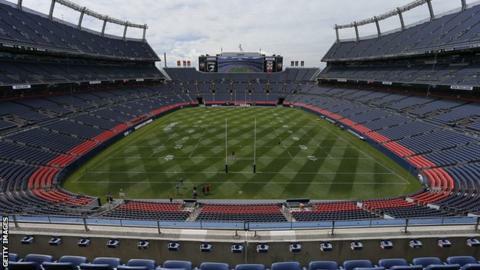 England's two Tests against New Zealand in Denver over the next two years have been cancelled. In the first of three planned matches, England beat the Kiwis in June in front of 19,320 fans at the American city's 76,125-capacity Mile High Stadium. Promoter Jason Moore did not meet a deadline to pay the Rugby Football League and New Zealand Rugby League. The Kiwis will instead host current world champions Australia and World Cup semi-finalists Tonga. The games in Denver were hoped to raise the sport's profile before the 2025 World Cup in the United States and Canada. Rugby League International Federation chief executive Nigel Wood said his organisation would be "seeking further discussions with the promoter" to assess "any potential implications" for the 2025 World Cup. It is the first time the tournament will be held outside Europe and Australasia, but the issue puts it under considerable doubt. England's 36-18 win over New Zealand was the first time they had played in the US since 2000. England captain Sean O'Loughlin said of June's game: "It was a great trip. I liked the concept, there was a decent crowd there and, game-wise, it was intense. They're the sort of games we want to play in. "Hopefully they come up with something else, a different idea we can have a go at. England need to have a mid-season game."